This forensic-type reconstruction was sculpted over a replica of the skull of BIG AL TWO, an Allosaurus discovered in 1996, from the Howe Ranch Quarry. Artist Michael Berglund, worked in consultation with BHIGR President, Peter Larson. Using the skull as the base upon which to accurately depict features likely to have been present, much like a forensic reconstruction, every scale, wrinkle, scar, and wart is represented. The teeth are casts of the original teeth, making this fierce creature seem to come alive. Special attention was paid to ensure that this reproduction reflects current scientific knowledge and theory. 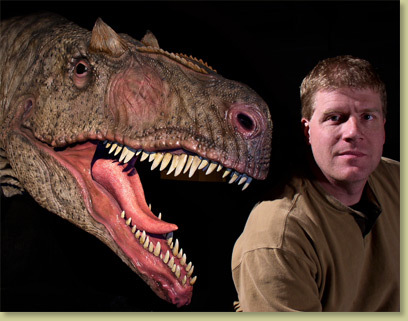 Consider exhibiting this incredibly detailed bust alongside the skull with neck replica (see "Allosaurus sp. BIG AL TWO Skull With Neck" in the Related Items links below). Notes May take approximately six weeks for delivery. Check with us to see if an earlier delivery is possible. Associated Literature Display poster with optional steel stand available.